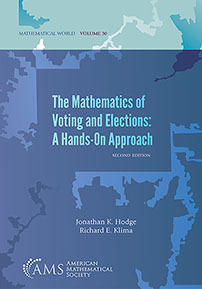 The Mathematics of Voting and Elections: A Hands-On Approach, Second Edition, is an inquiry-based approach to the mathematics of politics and social choice. The aim of the book is to give readers who might not normally choose to engage with mathematics recreationally the chance to discover some interesting mathematical ideas from within a familiar context, and to see the applicability of mathematics to real-world situations. Through this process, readers should improve their critical thinking and problem solving skills, as well as broaden their views of what mathematics really is and how it can be used in unexpected ways. The book was written specifically for nonmathematical audiences and requires virtually no mathematical prerequisites beyond basic arithmetic. At the same time, the questions included are designed to challenge both mathematical and non-mathematical audiences alike. More than giving the right answers, this book asks the right questions. The book is fun to read, with examples that are not just thought-provoking, but also entertaining. It is written in a style that is casual without being condescending. But the discovery-based approach of the book also forces readers to play an active role in their learning, which should lead to a sense of ownership of the main ideas in the book. And while the book provides answers to some of the important questions in the field of mathematical voting theory, it also leads readers to discover new questions and ways to approach them. In addition to making small improvements in all the chapters, this second edition contains several new chapters. Of particular interest might be Chapter 12 which covers a host of topics related to gerrymandering. Undergraduate students and general readers interested in mathematical aspects of various voting procedures.